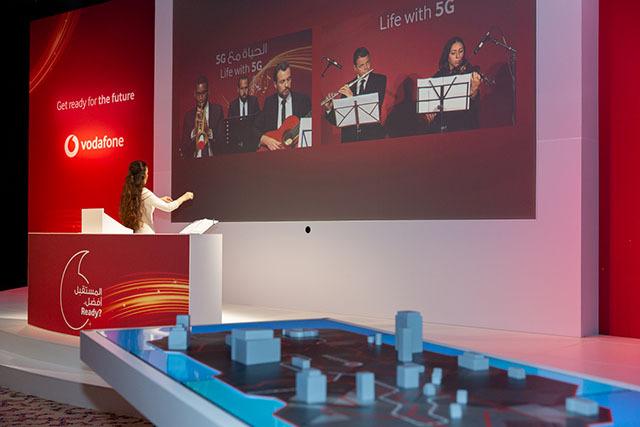 The transformative potential of 5G to improve how we live and work and fulfil Qatar’s potential came closer to reality as Vodafone Qatar announced the switching on its first, live 5G network. And to showcase what can be achieved with 5G’s ultra-low latency, the event included a faultless performance by the world’s first-ever 5G orchestra made up of five leading musicians in different locations performing music together that was perfectly synchronized thanks to the technology. And in another first for Qatar, attendees were entertained throughout the event by a digital Master of Ceremonies. Vodafone Qatar’s CEO Sheikh Hamad Abdulla Jassim Al Thani laid out the business’ vision for how 5G will accelerate Qatar’s journey towards becoming one of the most technologically advanced countries in the world. He also highlighted the transformative potential of 5G in changing how we all connect to people and things around us forever. The business is leveraging the expertise of its international peers to deploy 5G capabilities in the country. International Vodafone offices across the globe are currently working to completely revolutionise the way people work and live by transforming the internet. From conducting trials to leading research groups, the converged digital services provider is world-leading on the development of 5G, having completed the world’s first 5G call earlier this year.